Any good IDX website needs a solid contact management and email system to make it complete. Because an email management system provides you with an opportunity to further connect with prospects that have registered through the IDX on your website. Anyone who has registered to use your IDX search, has expressed an interest in buying real estate. By following up with them via email, you have an opportunity to engage with them to help them move further along down the buying process. An email manager built with agents in mind makes it easy to follow up with leads with built in email drip campaigns and other features tailored for home buyers and sellers. In addition, our real estate contact management software lets REALTORS schedule property showings, track incoming contacts from leads to prospects to sold buyers (or sellers), and more. 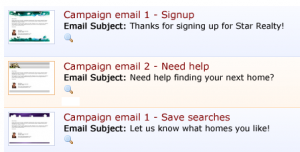 In other words: your IDX site will help you capture leads, but email and contact management software play a big role in converting IDX leads into home buyers and sellers. To help our clients follow up with their leads, we’re happy to announce that we’re now including the full version of our contact and email manager (dsAgentReach Pro) FREE for all new and existing users of our Mapping IDX service (dsSearchAgent Pro)! Up until recently, it was $20 per month to use dsAgentReach Pro to manage your contacts and email campaigns. We’ll we’re changing that. It’s now FREE with your purchase of dsSearchAgent Pro. Manage up to 10k total real estate leads and other contacts. Send up to 500 copies of each marketing email per day. Send 2k total emails in one day. Pre-made and custom marketing emails and drip campaigns. Create notes for individual contacts. Create tasks, including scheduled showing and appointments. Create alerts and reminders for tasks. Upload PDFs, photos, and more for sharing with home buyers and other contacts. Create unlimited contact groups (like “New Clients,” “Prospects,” “Sold Clients,” etc.). Send up to 10k emails per month. With these new free contact manager tools, you’ll have the ability to create and send marketing emails at any time. Sort buyers and sellers based on their search history, create custom drip campaigns, schedule appointments and reminders, and more. Best of all, all the lead management tools and email functions of dsAgentReach Pro are built into your existing dsSearchAgent IDX Control Panel. No more need to export your contacts or leads – – your IDX and lead manager are now housed together in a single admin area. All existing dsSearchAgent Pro users now have access to all dsAgentReach Pro features on their account at no additional charge. You can access these new unlocked features from the “dsAgentReach” menu in your existing Diverse Solutions Control Panel. Anyone who signs up for a new dsSearchAgent Pro account will automatically receive all dsAgentReach Pro features on their account at no additional charge. All existing clients using both dsSearchAgent Pro AND dsAgentReach Pro will no longer be charged monthly fees for dsAgentReach Pro, effective immediately. Our Broker and Lead Manager dsAgentReach add-on services will continue to be sold separately and are not affected by this change. One of the great tools included with dsAgentReach Pro is the ability to create an emailing marketing campaign to send out to new IDX users whenever they register to your site. To demonstrate this, I’ve included a video tutorial that walks you through the process of creating a drip-campaign. So now that you have all these great tools, do you have an email drip-campaign setup for your IDX users already? I started a 3 drip series here afew weeks ago, but no responses from it yet. Can write about campaign ideas? When is this supposed to be activated? I’m in my control panel now and I still can’t access the new features and I still have 1000 contact limit. I have both dsIDXpress and dsSearchAgent Pro. Hmm… What’s the name on your account? I’ll look into it. Now get to creating some drip campaigns for those new IDX registrations!